From left, Apollo 1 astronauts Virgil I. "Gus" Grissom, Edward White and Roger Chaffee pose in front of their Saturn 1 launch vehicle at Launch Complex 34 at the Kennedy Space Center. The astronauts later died in a fire on the pad. When astronauts venture into space, the walls of their spacecraft or the protective confines of their space suits are all that stand between them and the unforgiving nature of their cosmic surroundings. NASA's space suits and spacecraft are designed to insulate and protect astronauts from a range of temperature extremes — from the bone-chilling minus 455 degrees Fahrenheit (minus 270 degrees Celsius) of deep space to the scorching hot 2,300 degrees Fahrenheit (1,260 degrees Celsius) of atmospheric re-entry. But many people on Earth have also taken advantage of NASA-developed fire-resistant textiles – all without ever having to hurtle into the cosmos or plunge back into the planet's atmosphere. The agency's advanced research on thermal barriers and insulation for spacesuits, space shuttles and other vehicles have found earthly applications in firefighting, the military, motor sports and other industries. In the late 1950s, chemist Carl Marvel was studying high-temperature stable polymers for the U.S. Air Force when he first synthesized Polybenzimidazole (PBI), a synthetic fiber with an exceptionally high melting point. The PBI plant, located in Rock Hill, South Carolina, produced its first commercial bale of PBI fiber on March 18, 1983. PBI's outstanding thermal and chemical stability meant that it did not readily catch fire, unlike many other fiber materials. In 1963, NASA and the Air Force Materials Laboratory sponsored a number of studies on PBI, as they recognized the potential applications in the aerospace and defense industries. It was a tragic turn of events that really hastened NASA's need to address the fire risk faced by astronauts. On Jan. 27, 1967, a flash fire occurred in the Apollo 1 command module during a launch pad test of the Apollo/Saturn space vehicle. The Apollo 1 mission was set to be the first piloted flight of the Apollo lunar landing program. 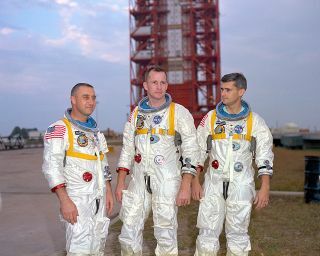 Three astronauts, command pilot Virgil "Gus" Grissom, a veteran of Mercury and Gemini missions; senior pilot Edward H. White, the astronaut who had performed the first U.S. extravehicular activity during the Gemini program; and pilot Roger B. Chaffee, who was preparing for his first spaceflight, died in the accident. The Apollo 204 Review Board released a final report on the tragedy, and while the source of the ignition was not irrefutably identified, the board determined that the early command module's design and construction flaws had contributed to the deaths of the three Apollo 1 astronauts. The board's final report made specific recommendations for modifications, including restricting the amount and location of combustible materials in the command module and the astronauts' flight suits. Following the Apollo 1 accident, NASA intensified its development of advanced fire-resistant materials, and one of the first alternatives considered was PBI. NASA contracted with Celanese Corp., a producer of chemicals and advanced materials founded in New York, to develop a line of heat- and flame-resistant PBI textiles that could be used in space suits and vehicles. The stiff fibers had virtually no melting point, and could retain both strength and flexibility after exposure to flame. The fabric was also resistant to mildew, abrasions and chemicals. During the 1970s and 1980s, PBI was instrumental to NASA's spaceflight program, and the material was used extensively on Apollo, Skylab and numerous space shuttle missions. PBI fibers were used in astronaut flight suits, clothing, and on tethers and other gear that required extreme thermal tolerance and durability. In 1977, Carl Marvel was awarded the National Medal of Science by President Ronald Reagan. In 1978, the textile was incorporated into fire service in the U.S., and in 1983, PBI fibers were made commercially available. PBI fabrics have since found countless military and civilian uses: lightweight, flame-resistant PBI fabrics provide protection for firefighters and U.S. Army troops in Afghanistan and Iraq. PBI fibers were also introduced for use in automotive braking systems and provide a fire-blocking layer in aircraft seats. The fire retardant material is still widely used in the aerospace industry, but PBI is also finding uses in new fields that demand stability at high temperatures. Interestingly, the polymer that made its debut in space during the Apollo program was under consideration for use as insulation material in the motors of the Ares I and Ares V rockets under NASA's now-canceled Constellation Program.